David Blumenthal, MD, president of The Commonwealth Fund, told attendees of the MMS State of the State conference yesterday that while federal health reform has fostered many important improvements in our health care system, there are still big gaps in access to care, affordability, and health status. Dr. Blumenthal said the U.S. is still “Two Americas,” where on the most metrics, the northern half of the country is generally much better off than the southern half. For example, he asserted that middle income people in the South are in no better a situation than low-income people in the Northeast. However, the Affordable Care Act has been the primary reason for “historic” improvements on several fronts. In the attached video clip, he outlines some of those changes. Then he reviews the experience so far in Massachusetts. How do you transform the health care system in mid-flight? Victor J. Dzau, MD, recently named president of the Institute of Medicine, argues that health care organizations have the ability to create an ecosystem that encourages the creation of ideas, nurtures them through experimentation, and then disseminates them to the rest of the health care system – up to and include commercialization. His video clip begins with the wry observation that “innovation was not invented in the United States,” and can arise from anywhere. His comments today were part of the 15th annual MMS State of the State of Healthcare Leadership Forum. View video clips from the conference’s other presentations. The CEO of the Cleveland Clinic provided a persuasive and moving case study today of how a health care organization can tackle the transformation of health care. Delos M. Cosgrove, MD, said the Cleveland Clinic has made significant improvements in the areas of affordability, access and quality. But he noted that none of these are important if a fourth critical item is missing: empathy. Dr. Cosgrove’s presentation was part of the MMS’ 15th annual State of the State’s Healthcare Leadership Forum. On the same day that President Obama spoke at Faneuil Hall to defend and promote the Affordable Care Act, the Massachusetts Medical Society’s 14th annual forum on the State of the State’s Health Care focused on the consequences and future of state and federal health reform. Calling the ACA “both a triumph and a tragedy,” veteran White House advisor David Gergen said the political firestorm currently surrounding ACA implementation – reports of consumers furious that their private insurance policies face cancellation – has seriously jeopardized the future of President Obama’s signature legislation. 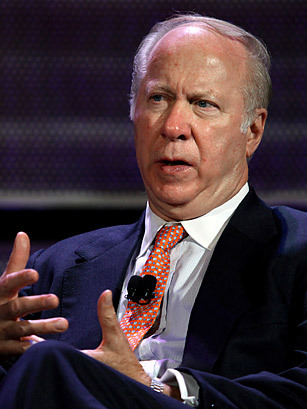 Gergen, currently director of the Center for Public Leadership at Harvard’s Kennedy School of Government, recommended a major public information campaign and more transparency from President Obama to rally public support for the beleaguered law. Stuart Altman, chair of the Massachusetts Health Policy Commission, spoke about the need for states to become more aggressive about reining in total health care spending – not just the amount public money spent to care for low-income or elderly patients. Because health care costs are disproportionately pushed onto the privately insured, the long-running cost-shifting model is unsustainable. “It is simply impossible for private insurance to make up for shortfalls in Medicare and Medicaid rates,” said Altman, a Brandeis professor who currently chairs the state’s Health Policy Commission. He predicted a noticeable decline in medical care nationwide if costs are not more quickly brought under control and tightly connected to quality and outcome data. “Not a `lights-out,’ but more like a `lights flickering,’” he said. Altman, a supporter of physician-led ACOs and bundled payment systems in Massachusetts, said the state’s new innovated approaches strive to avoid the “mistakes” of 1990s-era managed care systems, such as micromanaging doctors, dumping too much financial risk on providers, and forcing unwilling consumers to join plans. Control of post-acute care spending and an effective primary care system will be keys to the future success of Massachusetts ACOs, Altman said. Mayo Clinic CEO John Noseworthy, MD, spoke about his system’s culture of teamwork and patient-centered care. He said more work is needed in most other health care systems nationwide to reduce fragmented and uneven care – factors that drive up the costs of care dramatically. The Mayo system struggles with downward pressure on Medicare reimbursement rates, and Dr. Noseworthy said he expected the ACA would likely cut them an additional 15 to 25 percent. While Mayo has six campuses nationwide, Dr. Noseworthy said his system’s survival lies not in acquisitions or consolidation, but in scaling its practice knowledge and experience to affiliates at independent practices and hospitals. “We hope that our network can be an integrator for groups without the culture of an integrated practice,” he said. The program also featured a panel of Massachusetts health care executives: Tufts Health Plan CEO James Roosevelt Jr., Boston Medical Center CEO Kate Walsh, and Stuart A. Rosenberg, MD, CEO of the Harvard Medical Faculty Physicians at BIDMC. Dr. Rosenberg said he felt one of the most pressing problems was a failure to use IT to transform health care and help patients manage chronic health issues in their own homes. Roosevelt urged more collaboration between providers and payers to control costs, and said the state must be vigilant in monitoring provider consolidation to ensure better care for patients is the result. In her comments, Walsh focused on BMC’s dramatic financial turnaround in the wake of major state funding cuts. View video excerpts of the session here. The shortage of primary care physicians, besides creating longer wait times for both new and existing patients, is also changing how care is being delivered. National pharmacy chains are seeking bigger roles in patient care, like managing chronic diseases, and they’re developing partnerships with medical groups large and small across the country. Non-physician health professionals are also pressing for more opportunities. Nurse practitioners, for example, encouraged by a 2010 Institute of Medicine report, are engaged in advocacy and legislative efforts to establish independent practice, unburdened by physician supervision. Chapter 224 of Massachusetts General Laws, passed last year, included a new definition of primary care and expanded authority for NPs to sign documents once limited to physicians. This has given some NPs the impetus to set up independent practice. What effects will these efforts have on primary care? Let’s take a closer look. Retail clinics: How often and for what purposes patients will visit retail clinics remain open questions, as these clinics are just now expanding their services from basic offerings to more complex endeavors such as lab services and managing chronic diseases. Unlike many other states, Massachusetts health officials have established a long list of regulations that these limited service clinics must follow. However, Chapter 224 also requires the Department of Public Health to promote these clinics to the full extent of the scope of practice of NPs (who generally run these operations), but not to classify the clinics as primary care providers. Research shows that patients like the convenience of retail clinics, particularly when they have difficulty getting to their primary care provider. Given the limited resources and no onsite physicians, most patients may not regard them, at least for now, as a place for primary care. As they add more sites, services, alliances, and advertising, however, they are likely to play a bigger role in health care – a prediction already being made by health care analysts. Nurse practitioners: NPs play a vital role in health care. They always have, and they will play an even larger role as the team approach to care becomes more prevalent with medical homes and accountable care organizations. The idea, however, that independent practice by NPs can fill the physician gap falls short. For one, a nursing shortage exists alongside the physician shortage, and nurses, like physicians, are an aging part of the healthcare workforce, with more than half of nurses approaching retirement. The difficulty in recruiting nursing school faculty to teach a new generation adds to the problem. Independent practice by NPs isn’t likely to increase the number of primary care providers; at best it might redistribute some to underserved areas. Most now work in urban areas, as physicians do, and most hospitals will not allow NPs on staff without physician supervision. Further, with an emphasis on cost containment, replacing high-salaried providers (physicians) with lower ones (NPs) with less training will likely not result in savings. We have seen that less-experienced providers tend to order more tests and procedures, raising costs. Cost control will result best from the team approach of coordinating care and avoiding unnecessary referrals, testing, and procedures. Finally, as independent or solo practice by physicians is becoming less and less viable with the growth of medical homes and accountable care organizations, the same is likely to happen with nurse practitioners. While retail clinics and independent practices may have their place, continuity and coordination of care is much preferred over fragmented care from multiple providers. I believe the basis of good health care remains within the physician-patient relationship, supported by nurse practitioners, physician assistants, and other allied health professionals in a team approach. Patients will benefit most from this kind of an approach. Today, we released a new online publication, MMS Guide to Accountable Care Organizations: What Physicians Need to Know. Is your practice ready to join an ACO? How do you choose the right ACO? It’s available online for free to MMS members. Printed versions will be available next month. The Legislature has produced an ambitious health care roadmap for our Commonwealth. It seeks to make health care affordable for the residents, businesses and government of Massachusetts, while fostering quality, access and innovation. In many cases, the legislation strikes a responsible balance between the role of government as oversight entity, with the rights of private sector entities to operate responsibly. However, there are several areas where we have concerns. We are pleased that providers will be free to decide whether they want to participate in alternative payment methodologies. Global payments aren’t for everyone, and fee for service still has a vital role to play in our system. The cost benchmarks locate a middle ground between the House and Senate proposals. We have advocated for higher benchmarks than the bill provides, and we have our doubts about sustainability of these benchmarks. We are pleased, however, that the legislation provides the opportunity for adjustments and corrections in future years. We support the legislation’s decision to use a corrective action plan as the mechanism to hold providers accountable for their costs – as opposed to the more punitive measures outlined in previous proposals. In addressing payment disparities among providers, the bill fairly recognizes the real progress that the private sector has achieved over the last two years. We are extremely pleased that the bill includes the Disclosure, Apology and Offer model of medical liability reform that we have championed for many years. We believe that implementing this alternative to traditional litigation will foster a climate of safety and openness in all health care settings, especially when a patient is harmed by an adverse medical outcome. The commitment to full parity of mental health and behavioral health with other areas of medicine is most welcome. We strongly support the proposals to address shortages in the health care workforce. The initiatives to foster transparency of reliable cost and quality information will not only benefit patients, but will also assist providers in recommending the most effective and affordable tests, drugs and procedures for their patients. We are pleased to support the wellness programs that are outlined in the legislation; prevention is the best medicine of all. We are concerned about the impact of the bill’s very stringent reporting requirements on the smaller medical practices in the Commonwealth. We will look to clarify how small practices will be impacted by the costs and burdens associated with reporting to new entities established by the legislation. The state must ensure that such efforts avoid duplication and provide a true net benefit to our Commonwealth. We are concerned that the bill goes too far expanding the practice prerogatives of some groups of providers. In particular, we find that the favored status granted to limited service clinics to be unwarranted, and thinly supported by research or facts. The classification of physician assistants as primary care providers also raises questions. We will monitor these developments closely and will be prepared to advocate for corrective measures if there are unintended consequences. Clearly, the transformation of health care is only beginning. There is still much more work to be done. The Massachusetts Medical Society remains committed to working with all stakeholders, as we strive for a health care system that is effective, affordable and accessible to all. The Legislature’s House-Senate conference committee finally released its consensus payment reform bill last night. The House and Senate are scheduled to vote on it today – just in time for the end of formal sessions at midnight tonight. If you want to take a look at it yourself, here’s the full text and the Legislature’s own summary of the bill. We’re analyzing the fine print and will comment later.